Banda Saivarun from Hyderabad, B.E. - B.Tech Graduate. 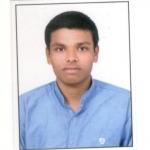 Banda Saivarun is ELECTRICAL RESUME and currently have no work experience. PVSYST AUTOCAD (2D) MS- OFFICE INTERNET ..
are one of expert skill area's of Banda Saivarun . Banda Saivarun is working in Production/Manufacturing/Maintenance industry.